I'm going to warn you right now. This isn't going to be much of a humorous post. When I first saw today's prompt I got a bit of a lump in my throat. And I wondered if I'd really be able to bring myself to write what I'm about to share with you. I don't talk about it much. But I live with the memories of death every day. So you see, I don't hang out much at cemeteries. Too many bad memories. My Dad died at 55, after his third and fatal heart attack, and my Mom a little over a decade later at 66 of kidney problems. Her last years on dialysis weren't fun. My former mother-in-law died one day apart from my mom. That was a fun week. My sister-in-law died of cancer a couple of years back, too. That was a big loss to our family. Because she was so full of life, right up to the end. And Mrs. D's Dad died at the outset of our relationship, 12 years ago. A very difficult time for her and her family. But worst of all, for me, was the loss of my eldest son 20 years ago. Michael was 18 when he passed away in a single car crash on the highway near where we lived. He wasn't wearing a seat belt and flew out the front windshield on impact. I'll forever live with the sight of two Ontario Provincial Police Officers showing up at my office with the news. And of going with them to identify the body. And of telling my then-wife and two children, all in separate conversations, what had happened that morning on Mike's way to school. But while I think of the denial and long-in-coming acceptance of what happened that day - for all of us, although who can really ever accept such a thing - I also think of the good things, the many good things Michael brought to our lives. And I think of them every day. Jonathan Michael MacDonald Bray. Jonathan because that's what my then-father-in-law called me and we thought he'd get a kick of making that his first name. And he did. Michael because we liked the name. MacDonald because that was my then-mother-in law's last name. It caused some confusion for Mike at school that his first name was Jonathan and his teachers thought he should be called that. But Mike was up to the challenge. Indeed, his teachers wanted to put him in the special advanced class. He was a bright kid. But he was well adjusted. Mature for his age. And while the other kids were very bright, they weren't as balanced as Mike. So giving in to Mike's wishes, we let him off the hook and he didn't have to be known as, how he put it, "one of those egg heads". And we often kidded we'd named him appropriately with the MacDonald's moniker. He loved that food. Hell at, 14 or 15 he was working there and would come home smelling like a hamburger. It was before he could drive, so I'd pick him up when the store closed every night. And he learned to drive early, taking Driver's Ed at school. We were happy to pay. It meant a big discount on our car insurance. When he turned 16 one of our cars was a Ford Tempo. It virtually became HIS car. And he loved visiting his friends and going to school in it. And he wasn't going to wait to get his license. t would take 2 or 3 weeks before they could test him at the License Bureau in town. So Mike phoned around to some of the smaller towns nearby and found one that could take him the next day. So Dad and Mike made the hour or so trip for the test. He was a great son and - one couldn't ask for a better one - and wonderful brother to look up to for his two adoring siblings, then 7 and 5 and now 31 and 29 - and also great kids. Their brother would be 38 in September. Two quick stories about his love for music, my music. When he was a baby, we woke up to an odd sound coming from the family room. Mike had crawled from his bed and had taken all of my LPs out of their covers so he could play them on his music box Fisher Price record player. Needless to say all the records were scratched and had been played for the last time. When he was older, around 13 or so, we had just moved into a new house. It would be the house he would live in the rest of his life. One day I was walking around the corner to the mailbox and saw in the field across the street a broken vinyl record. I glanced down at the label and thought "Hey, I have that record." Except when I went looking for it I couldn't find it. After about the third discovery I started to catch on. I asked Mike if he knew anything about it. Straight as the day is long he said "Sure Dad, my friend and I were throwing them in the field. They make great frisbees." Mike loved music. In that regard the apple hadn't fallen far from the tree. But so much for him liking MY music. Tomorrow's Father's Day. And the rest of my kids will be here. You know, I think Mike will be too. Oh, John. I'm so sorry for your loss. Thank you for sharing some of your memories of your son. He sounds like a wonderful person, and very much like his father. I'm sorry this prompt brought up so many painful memories for you. Thank you for sharing John. I feel like I got to know your son just a little bit reading this today. Mo lost her daughter at 27, so I know a little bit of what you must have gone through at the time, and what you must still go through. Sometimes sharing the story helps in some small way. I hope it did. What a lovely way to tackle this topic that is obviously so difficult. Your love for your son shines through even after all of these years of absence. I know that he will be with you in your heart and your children's hearts on Sunday and forever after. I'm so sorry for your loss...he sounds like he was an awesome kid! I am so sorry for your loss. Thank you for sharing that with us! I am sure he will be there with you tomorrow...maybe even to toss a frisbee around! Some days it is more challenging than others when someone has died. I know that Father's day must surely be one of those challenging ones for you. But , yes, Mike will be there. Just as I have posted, I believe those already gone are still with us, every day. May you sense his most obvious love for you tomorrow. Sorry for your loss. What a sweet and heart tugging story. And we all need a good heart tugging once in awhile. And you never stop missing your loved ones gone. I am so sorry for your loss, Dufus. As one parent to another I don't think I could say words meaningful enough to convey what I would like to . If the Internet let us send actual hugs you would be getting one. You're post is very touching. I wish you a lovely day tomorrow. I can't even fathom the kind of pain you suffered losing your son. It takes my breathe away to even think about it. I am so sorry you and your family had this major tragedy in your lives. I know they say time heals, but the loss is still there and will be always. One does not "get over" the loss of a child, but strong people go on. Happy father's day Honey. I know your sons (all of them) will be smiling at you! I'm sorry to read this. I've never lost anyone close and I'm not looking forward to it. My parents are in their upper 80s so sooner or later I will have to go through it myself. Such is life, no? I am so sorry for what you had to go through. It is always difficult losing a loved one no matter what age or circumstances, but so young and full of life is truly a tragedy. Wishing a Father's day filled with love for you and your family. They will all be there with you. My heart breaks for you. Much love, Dufus. Thank you for sharing, D. Can't begin to imagine. These are hard posts to comment on. I'll keep it simple and say I'm sorry you had to go through this and I hope his memory lives fondly each day in your mind and heart. Oh, John. I never knew. And I am heartbroken reading this. Thank you for digging up the strength to talk about your son. I really want to thank everyone for their heartfelt comments. You are all so very kind. This was probably the most difficult thing I've ever tried to write. 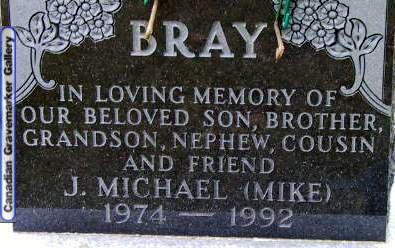 Mike was a great kid, a wonderful son and brother. I believe you are right about your son being there with you on Father's Day. The presence, the essence, the sweetness and interests of someone do linger. We think of them and they are alive in our heart. Being a parent has all types of moments - surprising, poignant, blissful, heartbreaking, lovely, educational... they're all there. You experienced what no parent wants to endure, but you are sharing that moment of your life and maybe that sharing will thin the memory. In that way, perhaps, the good and happy moments you remember will shine brighter and begin to soften and dissipate what you want to forget. May you be blessed with more thoughts - wonderful and clear - of the happiest moments with your children. Nothing but good memories really. In those, he certainly lives on.